One of the horses running for the roses in tomorrow’s Kentucky Derby is owned by a group that includes 10 Iowans. 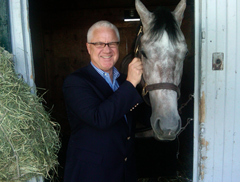 Des Moines attorney Jerry Crawford formed Donegal Racing and invited friends to join two years ago after he purchased the horse he named Paddy O’Prado. The group, also known as Derby Dreams, was formed with the goal of landing a horse in the Kentucky Derby. “If you’re golfer, you want to play in The Masters. If you’re football player, you want to play in the Super Bowl and if you’re into horse racing, you want a horse to race in the Kentucky Derby. It’s the biggest race in the world,” Crawford said. The horse with the Irish name displayed a bit of luck this week when he drew the most coveted starting position. Paddy O’Prado will leave the gate from the 10 hole, the post position which has produced the most Kentucky Derby winners. In addition, the favored horses, Lookin at Lucky and Sidney’s Candy, drew the two worst positions – posts 1 and 20. Thousands of Iowans will be cheering for Paddy O’Prado while watching the Derby on TV. “We’ve wanted this to be Iowa’s horse all along. It’s not just our horse,” Crawford said. “We hope it gives people a lot of happiness and enjoyment this weekend. We hope to make them proud. I think the horse is up to it.” One person who believes the 3-year-old colt owned by Iowans is capable of winning the Derby is famed jockey Kent Desormeaux. He’ll be riding Paddy O’Prado. Desormeaux has won more Derbies (three) than any active jockey in the world. “To have him to pick our horse tells you quite a bit about the fact that we have a legitimate chance on Saturday,” Crawford said. The only other horse owned by Iowans to race in the Kentucky Derby was Blumin’ Affair. He finished third in 1994.